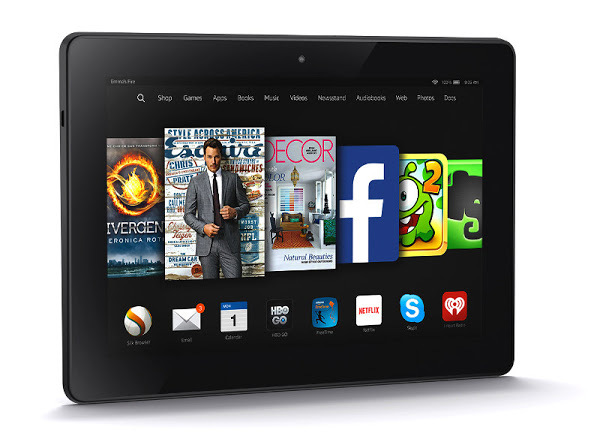 Amazon has launched new Kindle Fire HDX 8.9 tablet. The device comes with same 8.9-inch display and is powered with 2.5GHz Snapdragon 805 processor. Amazon also announced Kindle Fire HD 6 and new Kindle Fire HD 7 tablets. The new Kindle Fire HDX 8.9 sports a 8.9-inch display with 2560 x 1600 pixels screen resolutions and 339 ppi. It runs on new Fire OS 4.0 Sangria based on Android 4.4 (KitKat). It is equipped with a 8 MP rear camera with 5P f/2.2 lens and a front facing 720p HD camera. The tablet is coupled with 2 GB RAM and comes in 16GB/ 32GB/ 64GB variant. It is powered with 2.5GHz Quad-core Snapdragon 805 CPU with Adreno 420 GPU. The wireless connectivity of the device includes 4G LTE / HSPA+, Wi-Fi Dual-band, dual-antenna Wi-Fi (MIMO+HT40), Bluetooth with A2DP and SlimPort enabled USB 2.0. The Amazon new Kindle Fire HDX 8.9 is priced at $379 for the 3G version and the 4G version or Verizon will be available starting at $529. The device is available for pre-order from Amazon in the US. Spice Stellar 449 3G and Stellar Mi-508 Android 4.4 mobiles launched for Rs. 4,999.